WAIST HIGH: Peter Murphy Appears In Upcoming Twilight Film Eclipse. 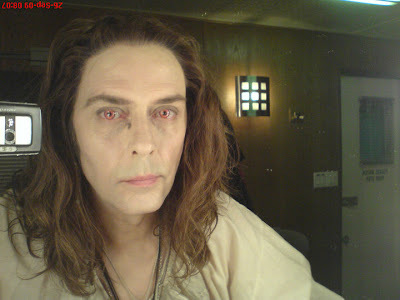 Peter Murphy Appears In Upcoming Twilight Film Eclipse. From Peter Murphy: Peter Murphy makes a central cameo appearance as 'The Cold One' in Eclipse, the most recent installment of the Twilight series. Eclipse debuts June 30 in the U.S. and July 1 in the UK, where Murphy will be walking the red carpet at the London premiere in Leicester Square at the Odeon Theatre (accompanied by his daughter, Hurihan). Murphy's last film appearance was in 1983 when Bauhaus performed "Bela Lugosi's Dead" in the opening credit sequence of Tony Scott's vampire thriller The Hunger starring David Bowie, Catherine De Neuve and Susan Sarandon. As a bookend to the now-infamous "Bela" performance, Peter felt that a cameo in The Twilight Saga: Eclipse was too good to turn down. "Who else could have and should have done it?" he laughs. "It was really lovely and smart of David Slade to ask me…I was honored, actually." Murphy's cinematic role marks the commencement of an eventful rest of the year for the artist, who launches his worldwide "Dirty Dirt Tour" in late July, and is adding the finishing touches to his new studio album Ninth, due in the Fall.